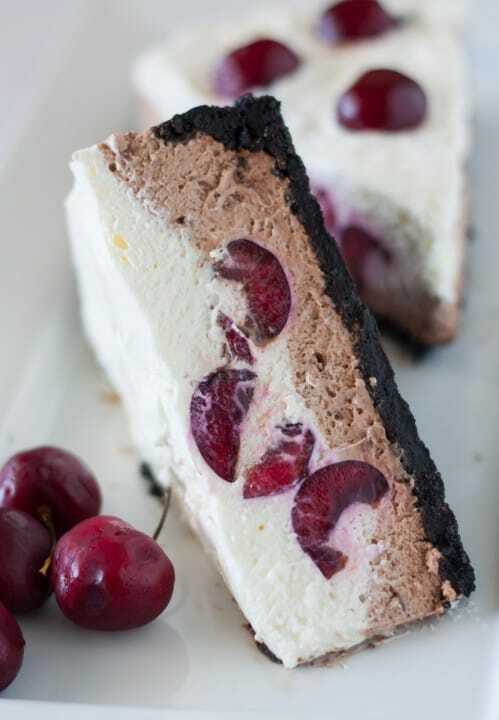 Chocolate Cherry Cheesecake with silky-smooth chocolate filling, topped with a layer of whipped cream infused with chocolate liqueur soaked-cherries. Cheesecakes are my weakness. The unlimited flavor combination creates an endless backlog of recipes to try and create. Not complaining here, I just know I have some work cut out in populating recipes for this blog. Chocolate or fruit flavored cheesecakes are a popular go-to, when you combine the two it’s even better! Another great combo is peanut butter and chocolate. View my popular Reese’s Peanut Butter Cup Mini Cheesecake Cupcakes post for that recipe. 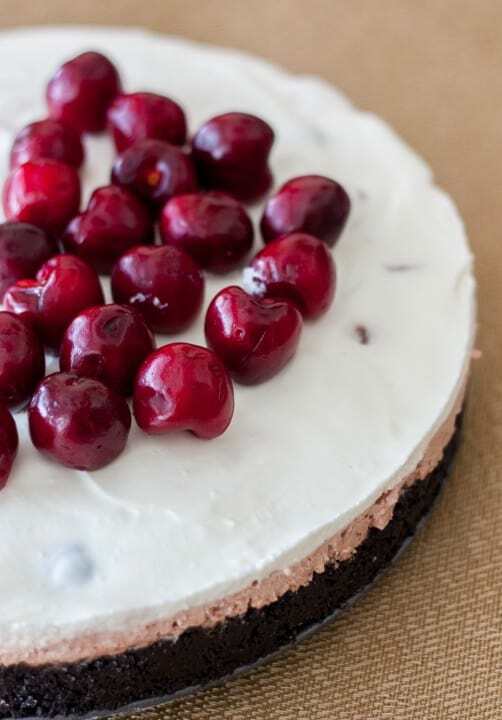 This No-Bake Chocolate Cherry Cheesecake has the best of both worlds. Rich chocolaty crust with a layer of silky-smooth chocolate filling, topped with another layer of tangy whipped cream infused with chocolate liqueur soaked-cherries. That’s a mouth-full to say and it’s even better in your mouth. Traditional baked cheesecakes have a denser, creamier texture, while this no-bake cheesecake has a unique mousse-like texture. The mixed in melted chocolate hardens in tiny pieces as it cools, creating little flavor bursts with each bite. The liqueur soaked cherries meld into the whipped cream layer, adding sweet and tart flavor throughout the cheesecake. – Chocolate can be melted in microwave or double boiler. Be careful to not over-heat and seize up the chocolate. – Soaking the cherries in liqueur infuses flavor and helps break down the structure slightly to make them moister and reduce tanginess. This Black Forrest Brownies with Toasted Almonds recipe has infused cherries as well. I shot this in natural light at 1/200 sec, f/ 2.0 . It was important to show the detail in the layers of this unique cheesecake. An overhead image did not show the internal detail as well. You can discern the layers, but not the important cherry pieces interlaced between. A cleanly cut slice on its side perfectly shows this detail. I happened to cut a nice slice that went right through a section of cherry pieces. The recipe has an elegant flair and a simple white dish creates this mood. Some whole cherries in the foreground creates a more complete scene and adds needed color to the photograph. In medium bowl combine fine cookie crumbs, melted butter and 1/3 cup sugar. Press into bottom and 1-inch up sides of a greased 9-inch spring form pan. Set aside. Place cherries in small bowl with liqueur to marinate. Drain after desired amount of time and discard or drink liqueur. In small saucepan, sprinkle gelatin over cold water (do not stir). Let stand for 1 minute, and then heat on medium-low heat, stirring until gelatin is completely dissolved. Take off heat and cool. In large bowl, beat softened cream cheese and ¼ cup sugar until combined, stir in cooled gelatin. Divide cream cheese mixture in half. In separate small bowl, melt chocolate chips in microwave in 30-second increments, stirring in-between, until melted. Cool slightly; while still in liquid form, stir into one half of the cream cheese mixture. Pour over prepared crust and spread evenly. In separate large bowl, beat whipping cream with mixer until stiff peaks form. Fold in other half of cream cheese mixture and drained cherries. Pour over chocolate layer in crust. Cover and refrigerate for 6 hours or overnight to set the cheesecake. Garnish with more cherries if desired. – Recipe adapted from Taste of Home: No-Bake Recipes. Print. Summer 2014. I made this for my daughter’s 30th birthday party and it was wonderful! Hi Jane! Thanks so much for the comment and glad to hear that! I love getting feedback like that. It means a lot when someone makes one of my recipes for their family or an event. Looks amazing! I never could resist chocolate and cherry. Hi Melanie. I agree it’s a glorious combo. Thanks for the comment and the pin!